Journey times will be cut by up to 1 hour and 15 minutes. This is an update of my piece on Bordeaux. They’ve spruced up the world’s wine capital. 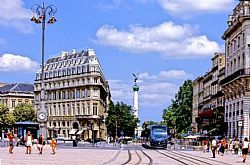 Bordeaux’s gracious old buildings are cleaner; its streets are calmer, and acres of rundown river bank are transformed. I visited the Port of the Moon, the agreeable city on a wide bend of the river Garonne in SW France, and found plenty of Paris chic, but at half the price. La Cité du Vin, which opened in 2016, is France’s latest homage to the grape. Built like a giant decanter swirling with wine on the edge of the river Garonne, it presents the history of French viticulture, in a self guided tour over 10 floors. Last stop is a high viewing floor where you may taste the wines of the world. The other big new feature is the Pont Jacques Chaban-Delmas, Europe’s largest lift bridge. Victor Hugo, author of Les Miserables, was star struck: Take Versailles, add Antwerp, and you have Bordeaux, he said. Baron Haussmann used the 18th-century city as a model when asked to make Paris a modern capital. Bordeaux won top marks for its exceptional architectural unity. In 2007 the cultural arm of the UN, UNESCO, didn’t stop to debate which of 350 historic monuments (clean and white after a brisk civic scrubbing) to include in the designation, instead naming the entire old city a world Heritage site. (Three of the city churches, on the pilgrim road to Santiago de Compostela, were already listed as UNESCO sites.) Best time to go is at night, when they light up everything. The tourist board run daily bus tours at 9 pm. But book early. Trips were full for days when we tried to reserve. An easy way into the rich and often complex world of wine is to take the daily vineyards tour from the tourist office, with the bonus of glorious scenery and picturesque chateaux. Our first call was a Sauternes vineyard, where we all leant on brand new oak barrels as the director gave us a little talk. Our reward was a generous glass of Premier Cru. On from there, with lines of vines retreating in all directions, to a Graves vineyard. The owner decided our keen attention merited a glass of white, shortly followed by a bonus red. (And no half measures.) The international contingent seemed very content, judging by the cheery chatter on the return journey. These informative trips continue all week into the many different vineyards that wrap around the city. Daily at 1.30. If, like ours, your house does not include a nice cool cellar in which to store your valuable vintage wine, I know the perfect place. We toured the massive storage rooms of Millésima, the Fort Knox of wine, in old Bordeaux. Stacked before us, ageing venerably in neat oak boxes, was £100 million pounds worth of wine, in 2.5 million bottles. They only deal in the 250 (very top) Grands Crus categories. Makes a change from buying bargain plonk in the supermarket, although there are bargains here for under £400 a case of 12, rising to £300 or more a bottle. Once you have bought, they will store your wine here in optimum conditions for years if you want them to. Then when you have a big celebration planned, give them a few days notice and they ship your wine up to you. They are happy to show visitors their cellars. Eating outside in a big old square, with lively conversation and impromptu music bouncing off high old buildings, and swifts screeching overhead, is one of the joys of southern France. The Café Francais is one restaurant to queue for, in Place Pey-Perland. As a bonus we sat in full view of the one major building the English would have known during their 300 year rule, which lasted until 1453: Saint Andre cathedral. With a wide traffic-calmed square in front, it probably has not been this quiet here since the dawn of the car. I recommend the Salad of the South West. For wine, look no further than the house white, red or rose: waiters tour the tables with open bottles. And if you cannot find a table outside, this usually means the locals have already booked them all. We dined well, inside, at the busy, trendy Villa Tourny. Where do you get the best view of a world class venue, the Grand Theatre Bordeaux? Book a room at the front of the Radisson Grand Hotel on the other side of Place de la Comédie, and look it in the eye. It is an aspect to rival anything you see in Paris or Rome. The theatre is lavishly fronted with 12 columns topped with statues of goddesses and the muses, in newly polished white stone. And the hotel itself is not bad, another product of Bordeaux’s elegant 18th and 19th century building spree. It is next to the Golden Triangle, the smartest shopping area of the city, which includes Rue St Catherine, France’s longest pedestrianised street. The Majestic Hotel, just round the corner, is a modest and comfortable alternative, in the restrained French style. Opera house conductors like it: three have donated their batons. The tram system is a wonderful way to tour old Bordeaux. The day ticket gives you unlimited travel until 1 am. Its route now extends over much of the length of the great curving river (hence the name Port of the Moon.). It is part of the ambitious urban renewal programme begun in 1996, which included planting the grey concrete expanses on the quays with shrubs, grasses and flowers, and restoring the façades of majestic old buildings and lighting them at night. On our tram trip along the riverbank we saw open air dancing and a lot of happy splashing about in the Mirror Fountain, if not quite what the planners intended. Take a trip on Tram B, which glides through the pedestrianised square in front of the opera house. The writer travelled by Eurostar and TGV from London.